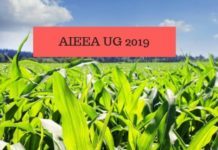 ICAR AIEEA PG – ICAR AIEEA PG will be held on an annual basis to enroll the aspirants for the postgraduate course in Agricultural & Allied Sciences. 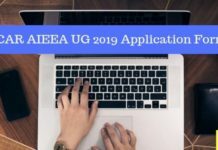 All the desirous candidates must ensure that they fulfill the eligibility conditions before appearing for AIEEA PG. The Council owns the right to make changes in the schedule and the number of seats for the ICAR AIEEA PG. Take a trip to this page to suffice your knowledge about the Eligibility, Exam Pattern, etc. The Indian Council of Agricultural Research (ICAR) is responsible for managing and supervising research and education in agriculture across the country. Through All India Entrance Examination for Admission, the aspirants will be considered for enrollment in the PG course based on their performance in the written examination. 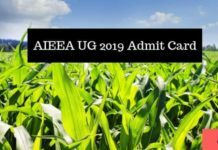 The candidates can get to know the highlights of the ICAR AIEEA PG through the tabular information mentioned below. Age Limit: A desirous aspirant must be minimum 19 years of age as on 31 Aug 2018. Qualifying Examination: The candidates belonging to General category must have obtained 60% aggregate (SC/ ST/PC require 50%) in concerned field under 10+2+5 (B.V. Sc. & A.H.), 10+2+4, 10+6 years degree (B.Sc.Ag.) programmes may apply for this examination. Few options for the candidates having passed Bachelor degree with 10+2+3 year degree programme are available in only two ICAR-DUs namely IARI Pusa and NDRI Karnal in some courses. For admission in M.V.Sc., candidates must have completed B.V.Sc.& A.H. with internship before the date of admission in the allotted university. The examination was held on the 22nd and 23rd of June 2018 which happened in the online mode. But ICAR will be reconducting the examination in offline mode(OMR based) for PG on the 18th and 19th of August 2018. The question paper will contain topics from each of the 20 major subject-groups. There will be a total of 150 multiple choice questions and each question will have four options. Exam paper will also include 10 cross-matching type questions. The Time allotted for the examination will be 2.5 hours. ICAR PG syllabus contains: plant biotechnology (4 units), plant sciences (4 units), physical science (4 units), entomology and nematology (2 units), agronomy (9 units), social sciences (5 units), statistical sciences (4 units), horticulture (2 units), forestry / agroforestry and silviculture (2 units), agricultural engineering and technology (7 units), water science and technology (4 units), home science (6 units), animal biotechnology (4 units), veterinary science (4 units), animal science (4 units), fisheries science (5 units), dairy science (4 units), dairy technology (3 units), food science technology (4 units), agribusiness management (9 units). You can download the ICAR PG syllabus PDF here. Multiple Choice Questions: For each correct multiple choice response, 4 marks will be awarded whereas 1 mark will be deducted for an incorrect answer. Cross-matching type questions: 1 mark will be allotted for correct pairing and 0.2 marks will be deducted for the incorrect one.